A newspaper article by Peter Reich published in The Chicago's American. The article provides a contemporaneous account of Dr. Calvin D. Fowler, manager of Cape Canaveral Air Force Station Launch Complex 14 (LC-14) and launch conductor, whose job was launching astronaut Gordon Cooper into space on a Project Mercury rocket. Original newspaper article: Reich, Peter. "Astronauts' Biggest 'Booster': Button Pusher with Prime Job." The Chicago's American, May 9, 1963: Private Collection of Dr. Calvin D. Fowler. Digital reproduction of original newspaper article: Reich, Peter. "Astronauts' Biggest 'Booster': Button Pusher with Prime Job." The Chicago's American, May 9, 1963. Originally created by Peter Reich and published by The Chicago's American. Copyright to this resource is held by The Chicago Tribune and is provided here by RICHES of Central Florida for educational purposes only. abort sensing and information system; ASIS; astronauts; Atlas; Atlas 130-D; Cal Fowler; Calvin D. Fowler; Cape Canaveral; Cape Canaveral AFS; Cape Canaveral Air Force Station; Cape Canaveral Air Force Station Launch Complex 14; Carpenter, Malcolm Scott; Carpenter, Scott; CCAFS; GDA; General Dynamics/Astronautics; Gordo Cooper; Gordon Cooper; launch; Launch Complex 14; launches; LC-14; Leroy Gordon Cooper, Jr.; Mercury; Mercury-Atlas; NASA; National Aeronautics and Space Administration; outer space; Peter Reich; Project Mercury; Reich, Peter; space exploration; space programs; spacecraft; Wally Schirra; Walter Marty Schirra, Jr.
Reich, Peter. 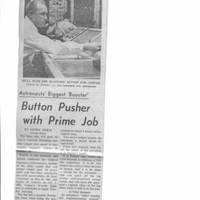 “Astronauts' Biggest 'Booster': Button Pusher with Prime Job.” RICHES of Central Florida accessed April 21, 2019, https://richesmi.cah.ucf.edu/omeka/items/show/4969.